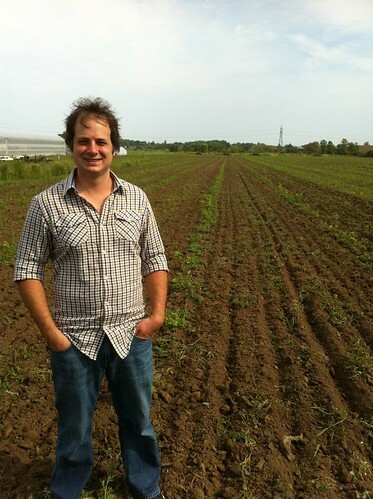 It had been almost two years since I last caught up with Ilya Senchuk at his Winona farm. Senchuk was just launching his virtual label, Leaning Post, and came out of the gate with two wines — a Riesling and a Pinot Noir — while making wine full-time at the appassimento style winery Foreign Affair. As I pull up to the farm, where Senchuk and his young family have planted roots, I find the winemaker on his almost-new John Deere tractor plowing between the rows of his young plantings of Pinot Noir. Senchuk and his wife Nadia bought the farmhouse that sits on 11 acres of agricultural-zoned land in the Lincoln-Lakeshore appellation. The farm came with an abandoned vineyard that hadn’t been tended in over 20 years. He has cleared the land and planted five acres in July to Pinot Noir and Chardonnay grapes. It’s an odd tract of land that he calls a “sweet spot” in Winona with atypical sandy, stony soil and a hard clay base and some interesting quartz mixed in. “We are like a weird little island in Winona. It’s like we’re saving it,” he says pointing out beyond his farm that is slowly being surrounded by urban encroachment on both sides of his property. His agricultural zoning ensures his property will be spared any industrial zoning and he’s using that gift to plant his once fallow field with five acres of Pinot Noir and Chardonnay. He expects the first crop in four years and plans on using about half purchased grapes to supplement his own grapes when the vineyard is in full production. Perhaps more importantly, the vineyard on the property has allowed Leaning Post to make the leap from “virtual” winery to full-fledged winery with its own manufacturing licence. Senchuk is currently on parental leave (he and his wife Nadia have a new addition to the family, a nine-month-old boy from his job at Foreign Affair and is busy being a parent while working the vineyard and building the winery and tasting/retail room out of the barn that came with the property. “I’m literally making wine in a barn,” laughs Senchuk. He made his first wines in the winery barn last year and will open a rustic tasting room and retail facility as soon as gets the retail licence sometime this fall (this will be where you can buy the 2010 wines, hopefully sometime this fall, or you try them now at restaurants such as Treadwell, Canoe or Jamie Kennedy’s Windows). 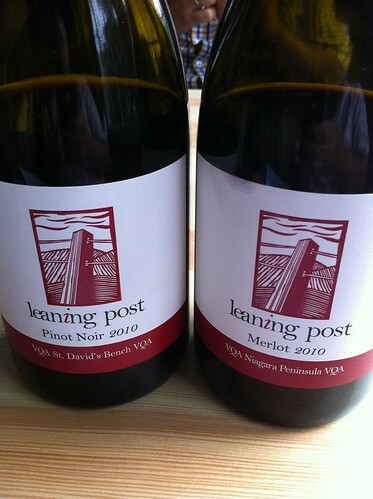 Senchuk’s first “non-virtual” releases will be the two wines he made in 2010 — the Leaning Post Pinot Noir Lowrey Vineyard (St. David’s Bench) and the 2010 McCleary Vineyard (Lincoln Lakeshore) Merlot. 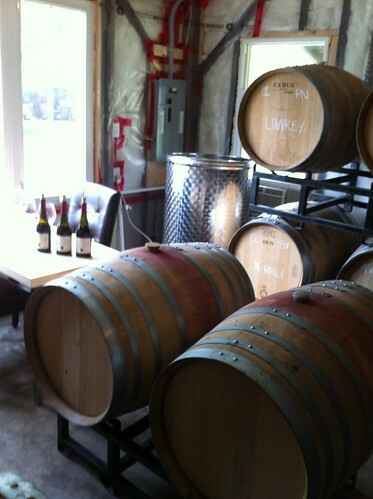 Only the Lowrey Pinot Noir was made in 2011 with a Foxcroft Vineyard Chardonnay, Lowrey Pinot and McNally Vineyard Pinot and Keczan Vineyard Syrah added in the 2012 vintage. Senchuk says he’ll return to Riesling with the 2013 vintage. For Senchuk, his philosophy is simple: He looks for wines that are vintage specific and chases those grapes once the season has revealed itself. With new vineyards, of course, Pinot and Chard will be staples every vintage and he’ll never give up his tiny allotment of Lowrey’s Five Rows Pinot. Beyond that, he will hunt down what he thinks will make interesting wines. Like his first Merlot from the McCleary Vineyard in the Lincoln Lakeshore appellation. And what a Merlot it is! This is what low yields, attention to detail, a warm Niagara vintage and a talented winemaker can do to a grape such as Merlot. 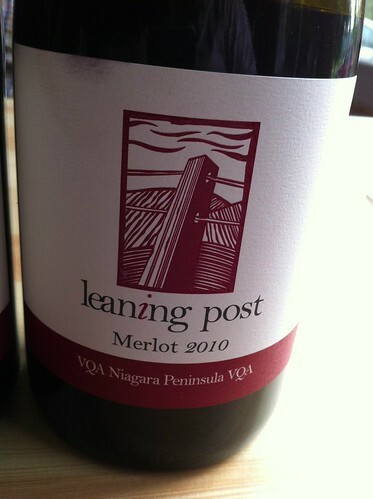 Leaning Post McCleary Vineyard Merlot 2010 ($38, 93 points, key restaurants until the retail store opens) — This wine shocked me from the moment it hit my glass. It has such a deep ruby red colour and aromas that won’t quit. Maybe it’s Senchuk’s experience working with Daniel Lenko and Foreign Affair, but he has built a personable Merlot with super concentrated black cherry, cassis, currants, smoky meat, lavish spices and toasty vanilla that jump from the glass. This spectacular wine spent 25 months in mostly French oak barrels (a little Hungarian) with two of the barrels new, and three of them neutral. It’s thick and rich on the palate with exuberant dark fruits to go with loam, tar, graphite, spices and a nice anise-licorice accent through the long finish. It’s built to last and improve for years as the tannins soften but I wouldn’t turn it down now with a great meal in front of me — especially if there was beef involved! 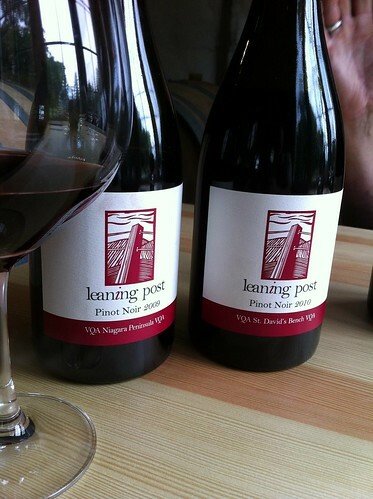 Leaning Post Lowrey Vineyard Pinot Noir 2010 ($38, 92 points, key restaurants until the retail store opens) — This is so cool. Consumers can now taste the three wineries that make Pinot from the oldest vines at Lowrey Vineyards, the historic Five Rows. Bachelder, Lowrey and Leaning Post get the lion’s share of those vines and each winery has given us a different take on the Pinot expression. Winemaker Wes Lowrey goes for a meaty, substantive style, Bachelder looks for a prettier feel to his Pinot and Senchuk is somewhere in the middle, but all three show a vineyard specific vein of similarity, or terroir. It would be very cool to try these wines side by side (I will throw in the other reviews of the Lowrey Pinot below). 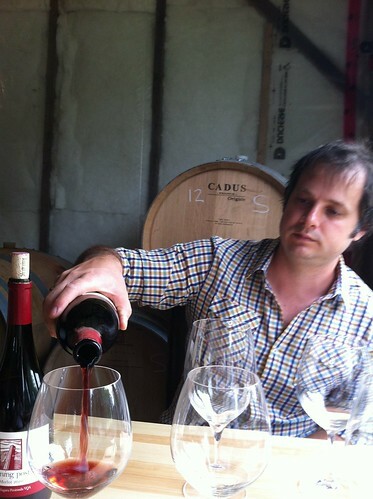 Senchuk thinks of his version of Lowrey Pinot as Pommard (Burgundy) meets Central Otago (New Zealand). “It’s as if Pommard and Otego had a baby,” he says. The 2010 Lowrey was picked Sept. 11 compared to Oct. 26 for the 2009 vintage. The nose shows pretty and floral notes with bright cherry, raspberry, cranberry, violets, cassis but also the meatiness of the vineyard and the funk and earth that defines Five Rows. It is fresh and finessed on the palate with red fruits playing nice with bramble, loam and oak-tinged spices that travel along a silky beam of acidity. 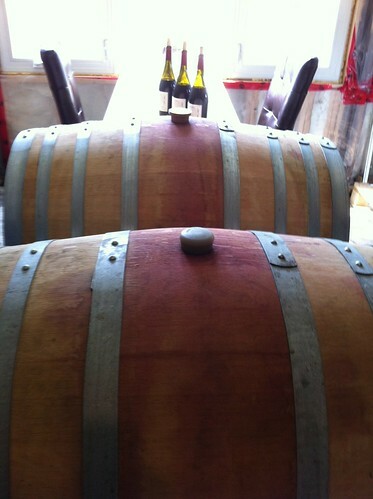 It is coming together nicely already but will become more harmonious with some time in the cellar. Very fine Pinot. For comparison, here are the current reviews for both Bachelder and Five Rows Craft Wine Pinot from the Lowrey Vineyard. 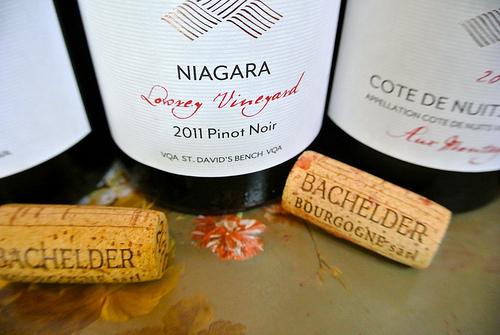 Bachelder Lowrey Vineyard Pinot Noir 2011 Niagara ($45, 92 points) — Bachelder sourced the fruit for his first Niagara Pinot from the Lowrey vineyard’s original five rows in St. Davids. This is a pretty Pinot with violets, black cherry, cassis and earthy-spicy notes on the nose. It’s ripe yet silky on the palate with gorgeous cherry-raspberry fruit that’s persistent through a lengthy finish. Such finesse and verve and balanced already. 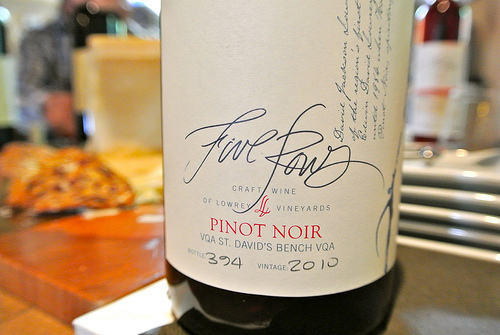 Five Rows Craft Wine Pinot Noir 2010 ($50, 92 points) — Lowrey takes two of the five rows of the old vines, planted in 1984, and blends in about two-thirds of Pinot from the rest of the vineyard to produce a paltry 143 cases of this wonderful wine. The nose shows loam, black cherry, field raspberry, violets, cassis and savoury spices. The beauty of this wine really emerges on the palate with darker fruits, smoke, mushrooms, dried savoury spices, licorice and layers of complexity that is all held together by a firm bed of tannins and oak. Lay it down for a few years for optimum pleasure.